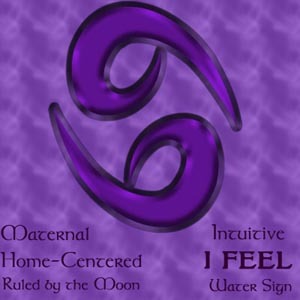 Those born with the moon in a water sign need to establish emotional commitments. Their emotions describe who they are in many cases. Before considering the practicality of a situation, before objectively examining the facts, they react emotionally. They are highly inuitive, though at times it is considered self-serving. As lunar Water sign personalities, those with Moon in Cancer may have a certain awkwardness in their approach to life. Things never appear crystal clear to a Cancerian Moonit is more like looking through the ripples of a lake. Creative and sensitive, they are apt to have an artistic talent or at least great appreciation for the arts. They are vulnerable to the influence of those with whom they spend the most time, making it hard to distinguish whether they are expressing their own opinions or merely reflecting those of someone else. As a result, the number one emotional reaction for a Cancer Moon is to lose themselves. They can be extremely passive when it comes to extricating themselves from unhappy emotional situations. They may even cling to such situations after they have managed to find happiness elsewhere. Cancer Moons hate to throw anything away. We have one Cancerian Moon friend who literally suffers separation anxiety taking out the trash. Cancerian Moon personalities are dedicated to getting their own way and accomplishing personal goals. They can be quite shy when initially confronted with unfamiliar situations and when meeting total strangers. Once they feel comfortable, they become more outgoing and even aggressive. Their nuturing nature makes them hospitable, compassionate, and philanthropic. Strong identification with the concept of family opens their hearts and homes. They often use this kind of approach as a successful ploy in getting others to cooperate. As adults they have an unfortunate tendency to use food as an emotional pacifier. Famous women with Cancer Moon: Gracie Allen, Anastasia, Drew Barrymore, Cyd charisse, Olivia DeHavilland, Bo Derek, Cass Elliot, Farrah Fawcett, Aretha Franklin, Julie Harris, Janis Joplin, Elisabeth Kubler-Ross, Pricess Margaret, Ethel Merman, Julie Newmar, Nancy Reagan, eleanor Roosevelt, Suzanne Sommers, Mae West, and Moon Zappa. Famous men with Cancer Moon: Tim Allen, william Blake, Pablo Casals, Kurt Cobain, Tom Cruise, Claude Debussy, Christian Dieor, Errol Flynn, Harrison Ford, Clark Gable, Graham Greene, Jimi Hendrix, Norman Mailer, Rod McKuen, George Orwell, Dan Quayle, Keanu Reeves, Franklin Roosevelt, Igor Stravinsky, Robert Wagner, Steve Wozniek, and Florenz Ziegfield.